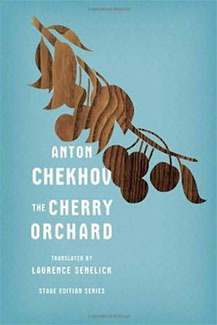 If there is one thing interesting -- remarkable indeed -- in the whole province, it's just our cherry orchard. You look boldly ahead; isn't it only that you don't see or divine anything terrible in the future; because life is still hidden from your young eyes. My father was a peasant, it's true, but here I am in a white waistcoat and yellow shoes. I never lose hope. I thought everything was over, I was a ruined man, and lo and behold -- the railway passed through my land and ... they paid me for it. And something else will turn up again, if not today, then tomorrow. Oh, my orchard! After the dark gloomy autumn, and the cold winter; you are young again, and full of happiness, the heavenly angels have never left you. A hungry dog believes in nothing but meat. When I am working hard without resting, then my mind is more at ease, and it seems to me as though I too know what I exist for.